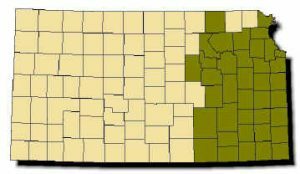 Range: Restricted to the eastern third of Kansas; generally found no farther west than the western edge of the Flint Hills. Description: Pattern of 7-20 distinct light-edged bands with no rattle on tail and a small pit on each side of its head between and slightly below the eye and nostril. Varies in color from gray to light brown with dark gray or brown crossbands. Head may be gray, brown or reddish. Belly is white with large dark gray, brown or black blotches on its edges extending a short distance up onto the sides of the body. Young look like miniature adults, but with yellowish or greenish tails. Habits: Prefers open rocky woodland, woodland edge and meadows adjacent to woodland. Pattern and color of this snake blends perfectly with forest leaf litter. In summer, it becomes nocturnal. 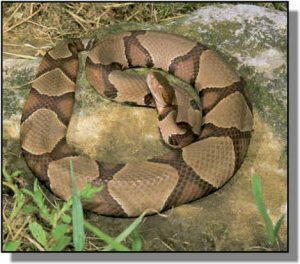 Because of its shy disposition and camouflage pattern, this snake exists in reasonably large numbers near areas of human population. During spring and fall, it is often found on wooded hilltop rock outcrops with a southern exposure. One to 14 young per litter are born from August to October. Eats insects, frogs, toads, lizards, small birds and other snakes; particularly fond of rodents.